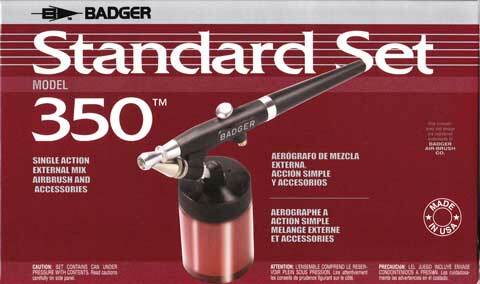 Single-action, external mix airbrush that is constructed of nylon/plastic and is easy to maintain and operate. Great for the handyman, craftsman, hobbyist or do-it-yourselfer. Air flow is controlled by depressing trigger. Fluid cap adjustment controls spray width. Bottom-feed style will accept 3/4 oz. or 2 oz. jar or 1/4 oz. cup. Medium line head assembly (from 1/4" to 1-1/2). The Standard Set includes a 1/4 oz. color cup, one 3/4 oz. jar, one 2 oz. jar, Propel regulator, a 6 ft. air hose, a can of Propel, wrench and instruction manual.